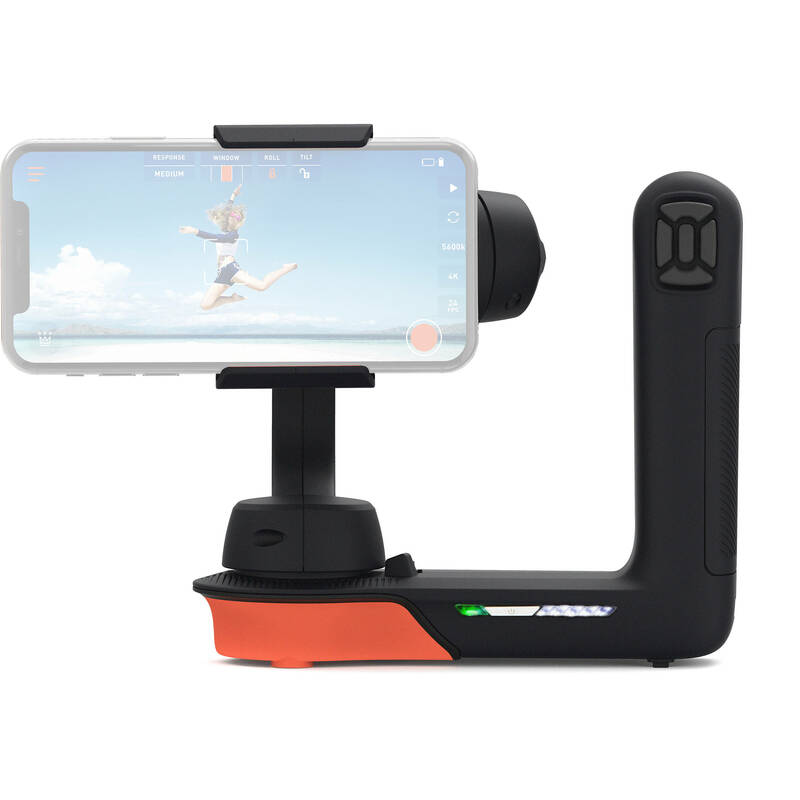 While the original MōVI series of stabilizers have established themselves in the professional video market, the Freefly Movi Cinema Robot Smartphone Stabilizer brings all of Freefly's experience and condenses it into a pint-sized, three-axis gimbal for just about anybody. The sleek form factor can be used with either one or two hands, and the smartphone clamp will hold phones up to 3.5mm wide. Once you've installed the app on your smartphone and secure the clamp, you're free to capture smooth and stable footage using one of the customizable operating modes. Select between Majestic, Echo, Time-Lapse, Movilapse, Smartpod, and Orbit modes, depending on the shot you want to capture. Check out the features section below for a more in-depth rundown of the operating modes. Majestic mode gives you direct control over the Movi stabilizer. The Movi will smooth out and stabilize your movements in two ways: 1) providing a movement threshold where Movi will ignore your movement completely, and 2) smoothing the movement outside this threshold to prevent jerky motion. These settings can be changed to be more responsive for tracking fast action, or smoother for slow cinematic moves. Echo mode allows a single operator to execute complex moves. Teach the Movi your favorite moves and then execute them mid-shot. Stretch out or compress the time it takes for Movi to get from point A to point B to get the perfect shot, whether the Movi is sitting still or moving with you. Time-lapse mode allows you to capture professional-looking, super-smooth time-lapse footage nearly anywhere. Set Movi down in an interesting place, frame your initial shot, set your start and end frame, and wait for some magic. The Movi will execute movements precisely, so that when played back at 10x speed, the world will look as if it's flying by. Movilapse mode is what happens when you wish to execute live motion with your time-lapses. In this mode, Movi responds to your control input 10x slower than normal. When played back at 10x speed, you get a super smooth shot of the world moving around you. In Smartpod mode, manually point your phone at a stationary subject and the Movi will do its best to keep your phone trained on the subject, regardless of your movement. Orbit mode makes epic circling shots a breeze. Set the direction of your orbit, and the speed, and the Movi will stay locked on the center of the orbit. Box Dimensions (LxWxH) 9.1 x 7.8 x 3.45"
Movi Cinema Robot Smartphone Stabilizer is rated 4.2 out of 5 by 23. Rated 5 out of 5 by Daniel P. from $300 Well Spent. For $300, this device quickly upgrades your videos from amateur to professional.? To begin with, the iPhone X is a remarkable platform that delivers sparkling results for the dimmest of users (i.e., myself) - but within two days - I've gained a full understanding of each of the Ninja modes.? I assure you this: If I can do it - you can do it. When combined with post platforms such as Movie Studio Platinum - this renders Sundance / Cannes quality clips. That's right, amigo/amiga... You too can be all that.? Just don't tell anyone - otherwise, everyone's going to have one of these - and then it's no longer a big deal.? So... Just between you and me, ok? Rated 4 out of 5 by Bill from Not an Osmo Radically different design from the crowded pistol grip gimbal market. Nice to be able to set it down. App syncs easily, and is very user friendly. I would like Filmic Pro level control though. Freefly promises firmware updates, and I trust that given their record. So cool stuff to come. Counterweight adjustment for add-on lenses is FAR superior to other Freefly gimbal balancing torture. A few criticisms: record trigger is awkwardly placed, there is no joy stick control, and vs pistol grip gimbals, it loses out on the “walk around filming” test. And no Z-axis stabilizer (I am going to try it in a Beholder spring arm). Rated 4 out of 5 by Michael from Loved it! I really loved this product! I would give it 5 stars but it should be more user friendly. For like noobs but i still loved this product for the amount of things you can do with it. Every recording looks so smooth and steady. Its a professional tool made easy basically. But there is always room for improvement. Also would love to see a “follow” mode on this! Where you could lock the focus on someone and that it follows only that. Would be awesome! Rated 4 out of 5 by Michael from Best Gimbal for Smartphone! I chose this higher priced Movi gimbal over the DJI based on the sturdy quality build, horizontal framed handle which allows to be set down.Standard functions as well as the built in modes on this product are great. I was surprised that there was no soft bag included for storage given the higher price point, although the unit comes in a case which is bulky and only fits the gimbal. I would like to see some sort of washer (preferably locking) on the Movi Counterweight Thumbscrews as they will just fall out of the bracket if not screwed in to the gimbal. Losing these screws on a shoot would render the counterweights useless. I agree with another reviewer that the Counterweight System does hit your knuckles while holding and finding the right balance can take awhile, so some suggested weight alignments for an iPhone w/Moment lens would have been nice, but once you get used to it it is fine. I would have also liked the idea of using some of the buttons on the D-Pad as arrows to pan and tilt while filming.....or at least give the user the option to program them to their taste? The record button could have a force feedback to acknowledge the start of a recording. The Movi app is great, but I would like to have the autofocus and exposure lock separately as there are times I would like to set exposure but keep the autofocus active, which at the moment is not the case. Aside from some minor fixes to the gimbal and app, this was a great purchase and I am very happy with it! Rated 5 out of 5 by Zeebo from Quick setup, smooth sailing Works right outta the box, no setup required. Just put my iPhone in and powered up. Very easy and intuitive to use. Build quality and smoothness to on par with freefly quality. They make good stuff. Fairly light eight but does start to get a bit hand strain after prolonged use. I’ll put it down on a table anywhere to rest my hand, or simply use both hands to offer relief. Do like the ability to quickly turn off the motor, lock in the gimbal, and keep my phone still strapped in and check on my messages and do regular phone stuff without having to remove phone. Then I can be back in Movi action within seconds of something catches my attention. Only drawback is the movi app only works on iPhones for now. Since I have an iPhone this was a non issue for me. Rated 5 out of 5 by Corey L from Simple to use and is inspiring my creativity I started out looking at the DJI competitor thinking this was the way to go. Our MD at work is also head of video production, when I asked his opinion he insisted I look at this. After watching a few review/comparison videos I was sold. It is both a challenge for me to learn the many features and in Majestic mode super easy to use. I've already started buying accessories - a bag and the Hoodie Accessory Mount. We have the Rode VideoMic Pro here at work so I'm going to shoot some more video with it. Love it! Rated 5 out of 5 by Mach from Awesome Hollywood in your pocket! when do anticipate the movi will be available for android system? At this time the manufacturer is saying the Android app will be made available in the future. Will the Movi work with Filmic Pro? According to Freefly the answer is yes and no.By default, Movi is in Majestic mode and will stabilize the footage no matter what app is being used.However, there are some things only the Movi app offers. Three examples are:Record start/stop from the Movis button.The type of recording such as Echo, Timelapse, Movilapse, and Orbit.Triggering mode-specific actions such as roll. My second attempt at this question !Will the gimbal balance with Zeiss Exo lenses ? With or without a counterweight. Does the Freefly Movi fully work with iPhones that have OIS? The FreeFly is for iPhones and for the most part works well with the iPhones OIS. In Majestic Mode, everything is fine stabilization wise unless you jerk it. Will the product ship to Hawaii? Yes, we have shipping options to send this to Hawaii. Simply add this item to your shopping cart and follow the check out procedures, your shipping options will be presented to you. If you need help placing an order feel free to call us up at 800-606-6969 and place your order over the phone. Can it be used in vertical mode? Yes it does shoot in vertical BUT the video will actually be recorded sideways so I use a free app called RFV to rotate the video after recording. Will this work with a pixel 2 on Android system? Sorry, but the is no Android app at this time therefore you will be limited in what can be done with this device. The phone seems to be marketed towards Iphone users due to app availability. Is there any support for android at this time? The word we have at this time is: Only the iOS app is currently available; the Android app will be made available in the future.